A dog’s sense of smell is his strongest sense. And the inside of your Labrador’s nose is a fascinating place! 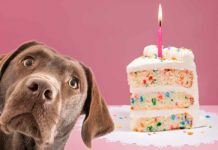 Scientists find dogs sense of smell interesting too, and have been very busy lately finding ever more scents that dogs can detect. To bring you the latest information on what dogs can do with their noses! And look at how that clever nose works and at just how accurate it is. So if you’ve ever wondered ‘can dogs smell cancer’ and ‘how far can dogs smell’ you’ve come to the right place. 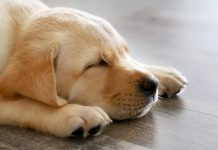 Your Labrador can detect tiny traces of substances that are completely undetectable by man. In fact his sense of smell may be up to a million times greater than ours. He can event detect substances undetectable by advanced technology. But why is your dog’s sense of smell so much better than yours? Let’s have a look. We all know that healthy dogs have a cold, wet nose. But why? The dog’s wet nose actually enables him to be more effective in detecting odors. 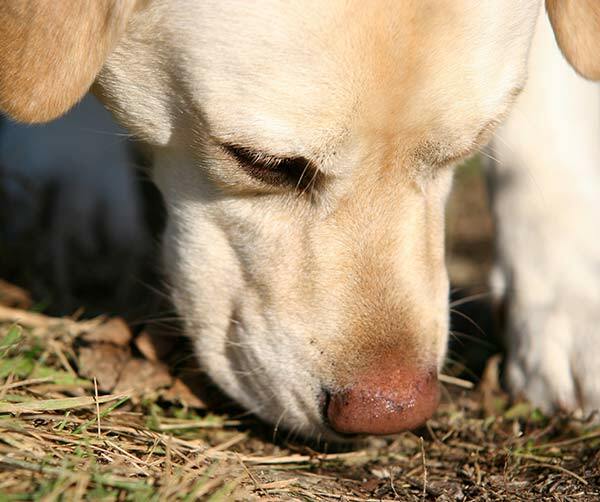 The moisture both traps scent particles and may also enable the dog to detect the direction from which they are coming. In order to improve their ability to detect these particles, dogs, and other wild animals will lick their noses from time to time. If we go a little deeper, and look inside your dog’s nose, we find quite a complicated structure. The inside of your dog’s nose is not an empty tunnel. We’ll have a look at what lies tucked away in there in a moment. But first consider this rather specialized ability: unlike people, dogs are able to divide each incoming nasal breath into two airflows. One for breathing, and one for scenting. A special fold of tissue just inside the nose creates this divided airflow. The air required for breathing is sent straight to the lungs. Whilst the air required for scenting, is diverted to a special area at the back of the nose. Turbinates are a kind of spongy, coiled, bone shelf, found in vertebrate noses. 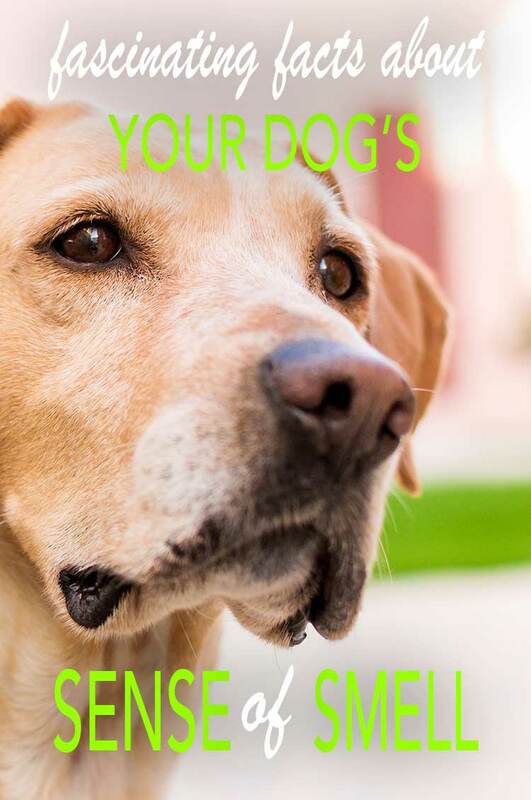 You have them, and your dog has them. They are covered in moist mucous membranes which are full of scent receptors. Your dog’s nasal passages are filled with these very fine bony shelves, and as the air he sniffs in passes over them, the scent receptors inside their lining, send electrical impulses to his brain. The way the dog’s nasal passages are constructed means it is quite hard to examine them. They are not simply open tunnels that we can look inside. The turbinates are not only scent detectors, they also act as a radiator heating up the incoming air, and trap moisture from the air as the dog breathes out. You can find out more about these fascinating structures and about some of the problems that can arise when they become infected, in this article. 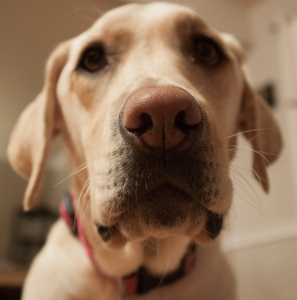 Part of what makes a great sniffer dog is down to the shape of a dog’s nose. A bigger, longer nose, can incorporate more extensive turbinates. This means that flat faced and short nosed dogs, will have a reduced scenting ability compared with their longer nosed cousins. [wp_ad_camp_2]The nose is the part we see and admire, but your Labrador’s amazing ability goes much deeper than that. Inside your brain, and the brain of your dog is a special area dedicated to processing smell. It is called the olfactory bulb. Humans have a very large visual cortex, for processing images, and a very small olfactory bulb, for processing scent. Your Labrador is different. He has a large olfactory bulb. Many times larger than yours. The electrical signals gathered from your dog’s turbinates are sent to the olfactory bulb via the olfactory nerve. The extra brain area devoted to olfactory processes means that your dog is far better equipped than you are to identify and discriminate between, different types of scent. Even in tiny quantities. So, how does this fascinating combination of complex nasal equipment and specialized brain translate into practical skills? How far can dogs smell? 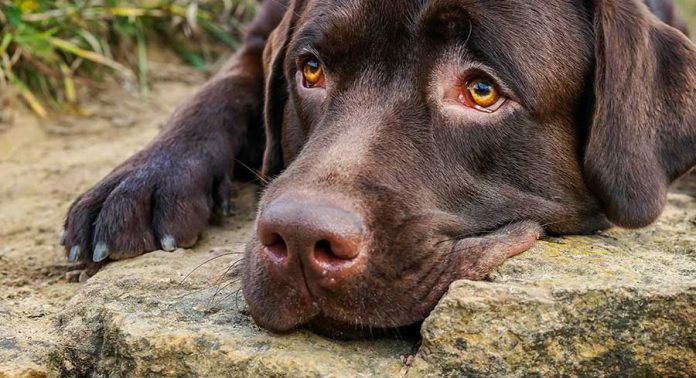 How far can dogs smell , or how far away does a scent have to be for a dog to be able to detect it, and how much of the substance we want the dog to detect does there need to be? It is interesting to know what kind of distances dogs can detect scents over, and how fresh scent has to be for a dog to be able to detect it. In fact, there isn’t much evidence on the subject of distance, and it probably depends on the dog’s scenting style. While all dogs are capable of detecting scent that is airborne, as well as scent trails along the ground. Some are more focused on one style or the other. Some dogs, such as bloodhounds, focus on ground scent and this is an ‘up close and personal’ style of tracking. The dog is right up against the tiny particles of scent that lay on the ground. Other dogs, some of our versatile gun dogs fall into this category, hunt by air scenting. Head up, sniffing the breeze to see what is carried there. Of course all types of scenting outdoors is going to be influenced by conditions. A study carried out in the 1960s showed that dogs were beginning to struggle to detect scent outdoors after three weeks or so. But indoors were still successful at identifying scents six weeks after they have been laid. The ability of a dog to succeed in a tracking endeavor outdoors is going to be heavily dependent on weather conditions and disturbance. As someone who keeps working gun dogs, I know only too well how humans stomping about where a wounded animal fell before it ran off, can interfere with a dog’s ability to track the creature successfully. As leaves and undergrowth carrying the tiny scent molecules are scattered by human feet. Interestingly learning to detect the scent of a live person and learning to search for a dead person are two different skills. A study published in 2006 suggests that it is better for dogs to specialize in one or the other. 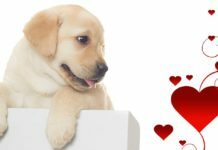 The astounding scenting abilities of our Labradors together with their trainability, has resulted in Labradors being trained for a wide range of skills that are enormously useful to mankind. As a breed, they are among the best tracking dogs known to man, and it isn’t just the dog’s scenting ability that accounts for his ability to work alongside humans. Being a good tracker dog is not just about sense of smell. These breeds account for a large proportion of search and rescue, drug and explosive detection, and medical detection dog breeds throughout the world. 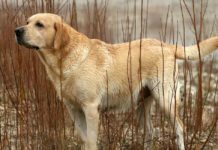 The field of using dogs, often Labradors, for detecting disease is a relatively new and rapidly developing one. We now have dogs that can detect tumours, low blood sugar, and even impending seizures, in their human partners. So can dogs really detect cancer? And with what degree of accuracy? The answer to can dogs smell cancer is yes they can! 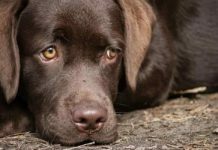 Several studies have demonstrated significant success in training dogs to discriminate between people with cancer and healthy individuals. Some dogs, possibly most dogs, can differentiate between healthy humans and those with tumors. But how do dogs do this, and should we now switch to dogs for our cancer testing, rather than other methods? Will dogs replace cancer screening? Well not just yet. In some studies, while dogs were able to identify cancer patients with a greater degree of accuracy than would occur by chance, it was not the level of accuracy we expect in modern medicine. What doctors are looking for is as close to 100% accuracy as possible. And there are many variables to consider when trained animals are being used to identify potentially life threatening diseases. The dogs’ accuracy will be subject to all kind of factors such as ‘training standards’ and ‘motivation’ and the dog’s own health, performance levels, age etc. So how do dogs detect cancer? Tumors growing inside the human body release chemical compounds and these compounds have odors that when released from the skin via sweat or other bodily fluids, can be detected by the sensitive nose of the dog . A study, published in 2008 showed that different cancers each have their own specific type of odor that differs from those of other cancers. All this doesn’t mean that your dog will know if you have cancer. Or if he does know, that he will think it relevant or be able to perceive the implications of that knowledge. The ability to identify specific odors as being important, and to alert humans to their presence has to be trained. 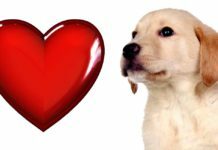 Nevertheless, the ability of dogs to offer a valuable role in this field of medicine has far reaching and powerful implications. It is just another example of the wonderful way in which dogs can benefit human beings. Is there a limit to how many smells a dog can be trained to detect? Possibly not. At least if there is a limit, we haven’t found it yet. A study published in 2002 showed that “The detection of previously learned odors did not decrease as the number of substances trained increased. In other words, dogs get better with practice. It would seem that they are not. We won’t be dispensing with the help of our dogs for a while yet! So how long can a sniffer dog carry on being a sniffer dog? Does his sense of smell get worse as he gets older? Well, yes, old dogs have inferior scenting ability to younger dogs. But a dog’s sense of smell does not diminish for many years. Studies have shown that aging does cause measurable changes in a dog’s sense of smell, but not until they reach the grand old age of fourteen or so. All breeds of dogs other than very short nosed (brachycephalic) dogs have this extraordinary scenting ability. However, scenting ability is not all that is required for dogs to be able to carry out sophisticated tasks and to work co-operatively alongside humans. 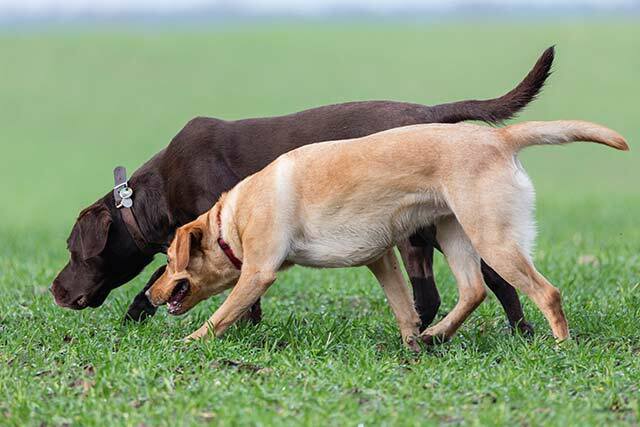 Scent detection and tracking is something that dogs improve at with practice. Medical detection dogs, dogs that detect explosives, dog that detect drugs, and even bed bugs, still need training. 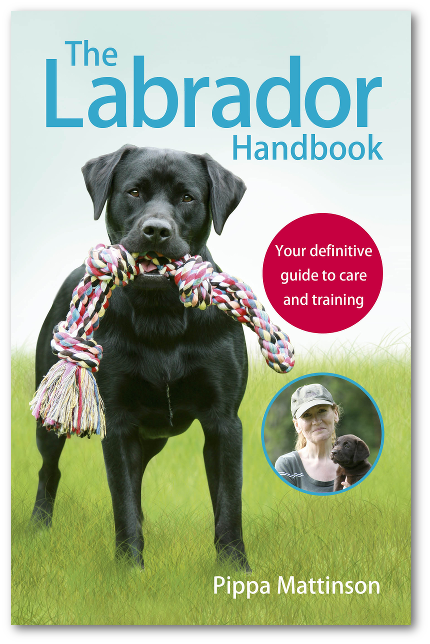 And of course, the ease with which our wonderful Labradors can usually be trained is another reason that they are often selected for these roles. Has your dog amazed you with his sense of smell? Let us know in the comments below. Guerrero-Flores H et al. “A non-invasive tool for detecting cervical cancer odor by trained scent dogs” BMC Cancer 2017. Jezierski T et al. “Study of the art: canine olfaction used for cancer detection on the basis of breath odour. Perspectives and limitations”. Horowitz A. “Inside of a dog” Simon and Schuster 2012. Cornu J et al “Olfactory Detection of Prostate Cancer by Dogs Sniffing Urine: A Step Forward in Early Diagnosis” European Urology 2011. Craven B et al “The fluid dynamics of canine olfaction: unique nasal airflow patterns as an explanation of macrosmia” J R Soc Interface 2010. Horvath G et al “Human ovarian carcinomas detected by specific odor” Integr Cancer Ther 2008. Moser E, McCullock L. “Canine scent detection of human cancers: A review of methods and accuracy” Journal of Veterinary Behavior: Clinical Applications and Research 2010. Pickel D et al “Evidence for canine olfactory detection of melanoma” Applied Animal Behaviour Science 2004. Hirai T et al. “Age related changes in the olfactory system of dogs.” Neuropathology and Applied Neurobiology 1996. I have 2 incredible things going on with our 13 month old Black Lab-Leia began pushing me out of bed when she was 9 months old and forcing me to go downstairs with her-I would then have a terrible headache-do a finger stick and find out my Glucose had dangerously dropped-she does this everytime it happens so yes she can smell Diabetes changes in Glucose. I also had cancer surgery 10 months ago-in the past 2 months she has been laying on my chest and pawing me in the same spot and breathing hot breath on the spot-went for my 6 month wellness CAT and PET scan and found out I have recurrence lung cancer way down in the lung at that exact spot…Just amazing Huh ?? I rescued Zeus my Yellow 2 year old lab from A local shelter about 6 months ago. I quickly came to discover he has NO sense of smell and his eye sight is Hopefully typical. I throw a ball of any color and as long as he can see its movement he will retrieve it with great gusto. However once the ball stops moving it is lost to him. Even if it is just a few feet away. I have taught him the command search and once given he starts sniffing in an ever widening circles with no apparent clue as to where the ball is. Once the ball is directly in front of him he will see it and bring it to me. I try to get him to use his nose by taking treats and throwing them around the yard. Unless I point to them he never finds them. I watch him put his nose on them but not recognize them. He has become very trusting in me. I have to be careful. I was cracking an egg one day for breakfast and the shell fell on the floor. He took the shell and crunched down on it and spit it out. Same with potato peals. Hopefully that means his taste is working. More proof is if he is asleep and I am cooking and the house smells of food, he does not wake up to the smell. Once he sees me in the kitchen he realizes what I am doing and comes in and wants what every I am cooking. He knows Daddy makes good stuff. My question is this. Is there a way to help him develop his smell? And how common is this? While I know he can smell (he definitely can sniff the treat out of my hand), he tends to use and possibly trust his eyes more than his nose. For instance, there have been so many times when I hid the treat and his nose was on the treat, but he didn’t realise and grabbed only when he saw it, or when I hid in the house- he was right next to me but didn’t realise it till he saw me. Is there anything I could do to strengthen his sense of smell? My chocolate lab loves showing off his scent skills. our children put him in another room and hide treats all round the house, bring him in and tell him “find the treats”… being a lab, he doesn’t take long. Another trick is to show him both your closed hands and ask him which hand the treat is in and he chooses by putting a paw on the hand… always correctly. Finally, my trick is to throw a small treat into bushes when we are out walking and he will sniff it out. My black Lab started waking me up all the time during the night. I was upset with her till I found out I had sleep apnea…she was waking me when I stopped breathing!! Wow, what a clever dog! Nicola, I do exactly that, having discovered that she goes deaf when her nose is buried in something. However, what I am unsure how to do is then teach her to recall even when she wants to bury her nose in something. She is great at recall from people or other dogs and we have worked hard on creating situations where she can succeed in recalling from people or other dogs. But I am struggling as to how to get her to recall from a scent and given she loves burying her nose in all sorts of things that I would not want to have in my house, I would welcome any suggestions of what to do. Surprisingly, for a carnivore Benson is passionate about bananas which I suspect has something to do with the delicate aroma? Must see how he responds to the fruit of the durian! My labrador always wakes up when we prepare food, even if he is not on the room! If their sense of smell is so good, why does mine; go deaf when she’s smelling something and need to stick her nose in to whatever she’s smelling? Maybe he wants to smell better!